The exhibition marks the first time the artist has worked in the medium of tapestry and will include a series of preparatory works on paper in an installation conceived by the artist for the Gallery's Sunley Room. 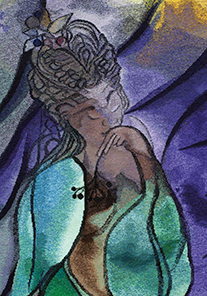 Ofili is returning to the National Gallery following the exhibition Titian: Metamorphosis 2012. In this he was one of three contemporary artists asked to respond to Titian’s great mythological paintings, Diana and Actaeon, The Death of Actaeon, and Diana and Callisto, which depict stories from the Roman poet Ovid’s 'Metamorphoses'. Ofili produced new paintings in which the classical world was transposed to Trinidad, where he lives and works. He also designed a related series of costumes and sets for a new ballet performed by the Royal Ballet at the Royal Opera House, Covent Garden. The imagery in this new tapestry reflects Ofili’s ongoing interest in classical mythology and contemporary ‘demigods’, together with the stories, magic and colour of the Trinidadian landscape he inhabits. Like Rubens, Goya and many artists before him who have engaged with this medium, Chris Ofili has been collaborating closely with master weavers to see his design translated into a tapestry. It is being hand-woven by the internationally renowned, Edinburgh-based Dovecot Tapestry Studio, and has taken two and a half years to complete. Chris Ofili came to prominence in the early 1990s with richly orchestrated paintings combining rippling dots of paint, drifts of glitter, collaged images and elephant dung. His is a seductive art of braided connections that draws on a wide range of sources – including jazz and hip hop music, Blaxploitation movies, the Bible, and the works of artist and poet William Blake. Ofili's recent works adopt more gestural, pared-down forms, inspired by his relocation to Trinidad, while maintaining a sense of the expansive, dramatic and romantic. Chris Ofili was born in Manchester, England, in 1968, and currently lives and works in Trinidad. He received his BA in Fine Art from the Chelsea School of Art in 1991 and his MA in Fine Art from the Royal College of Art in 1993. Work by Ofili has been the subject of solo exhibitions worldwide, including recent shows at the New Museum, New York (2014), travelling to The Aspen Art Museum (2015); The Arts Club of Chicago (2010); Tate Britain, London (2010 and 2005); kestnergesellschaft, Hannover (2006), The Studio Museum in Harlem, New York (2005), and Serpentine Gallery, London (1998). He represented Britain in the 50th Venice Biennale in 2003 and won the Turner Prize in 1998. Commissioned by the Clothworkers’ Company, a livery company established in 1528 to oversee the cloth-finishing trade in the City of London, 'The Caged Bird's Song' will go on permanent display in Clothworkers’ Hall following the National Gallery’s exhibition of the work. The exhibition runs from 26th April – 28th August 2017. See the gallery website for more information.